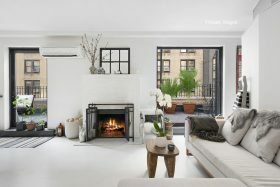 This two-bedroom penthouse at 205 East 69th Street in the Upper East Side certainly has no dark side: The apartment’s walls are lined with pre-war Deco-style casement windows and doors, just outside which you’ll find spacious wrap-around terraces in every direction. 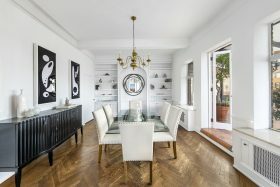 Asking $3,295,000, this uptown oasis has cultural bragging rights as well: It was the New York City home of developer, preservationist and visionary David Wolkowsky, who is considered to be the most important transformational influence in modern-day Key West, Fla., and credited with creating the island’s reputation as a quirky bohemian oasis and tourist destination. Wolkowsky, who was known as “Mr. Key West,” passed away last year at the age of 99. Photo courtesy of Compass. Photo credit: Donna Dotan. 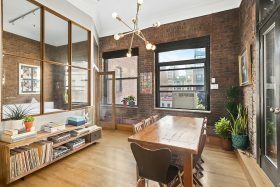 The interiors of this fifth-floor co-op at 12 Greene Street in Soho bring to mind a perfectly redesigned deco-era London terrace house or a dreamy country estate more than the average Manhattan penthouse. 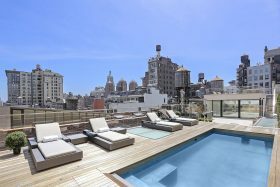 To top it off, three levels of private roof terrace gardens wouldn’t be out of place in either, complete with mature trees and a reflecting pool. 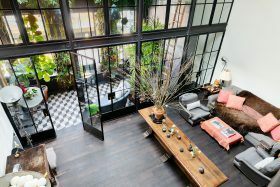 As unusual as it is expensive–it’s asking $9.95 million–this three-bedroom downtown oasis boasts a renovation that spared no luxury and considered every angle, from a rustic loft-like kitchen and a fabulous array of bespoke floor tiles to the aforementioned gardens. 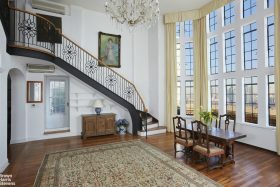 This pre-war triplex penthouse, listed for $2.85 million, sits atop the Murray Hill apartment complex known as Windsor Tower at 5 Tudor City Place where “Scarface,” “The Godfather,” and “Spider-Man” were filmed; a nearly identical penthouse unit can be seen onscreen as the home of Spider-Man’s green nemesis, Willem Dafoe’s Green Goblin in the popular movie and yet another penthouse was featured in both Woody Allen’s “Bullets Over Broadway” and “The Godfather: Part III.” But you don’t need Hollywood cachet to appreciate 18-foot ceilings, a wall of casement windows overlooking the East River, a wood-burning fireplace, or a dramatic staircase that curves its way up to an intimate terrace. 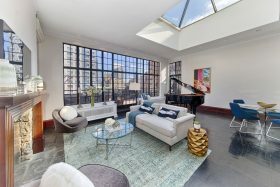 Spanning an entire block, this sprawling penthouse at 5 East 17th Street boasts four bedrooms, two private elevators, a 25-foot glass atrium, and a 4,000-square-foot “private sky yard” with a swimming pool, fire pit, and gorgeous city views. 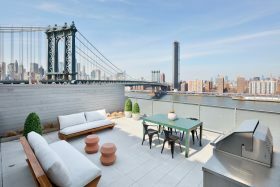 No luxury has been spared in this fully-renovated, sleek, and abundantly sunny condo, centrally located on the border of Flatiron and Union Square. 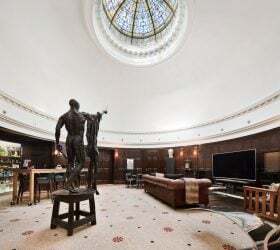 A previous sale fell through at the last moment, and now the $15,500,000 unit is back on the market. 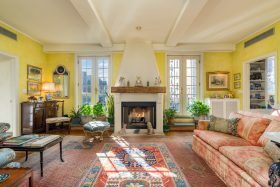 This pretty two-bedroom penthouse co-op at 115 East 90th Street, asking $2,295 million, is the picture of classic pre-war charm. Its best feature: It’s wrapped on every side with landscaped terraces surrounding the home with a garden paradise no matter where you look.